Since I explained Pancha Pranas in matter and beings, let me explain how tanmAtras (the five measures) relate the pancha prana to pancha bhuta. These relationships explain how saMkhya is a design pattern for Universal matter and beings, before I move on to saMkhya kArika. Vrtti are ensemble of matter particles with five different thermodynamic potentials (pancha prAna). Based on pressure, volume, temperature, entropy differentials (called tanmAtras) these ensemble of particles manifest in five different states of matter (pancha-bhutas) to evolve more complex structures of matter. Vrtti are also ensemble of biological cells (organ systems) with five different biological functions (pancha-prAna). Based on Catabolsim, anabolism, homeostasis, levels of consciousness differentials (called tanmAtras), these organ systems processes the five different states of matter (pancha-bhutas) to evolve more consciousness in biological beings. Matter particles are force-fields in which energy and mass manifest. These matter particles become subjected to different thermodynamic energies. The ensemble of particles with these thermodynamic energies is Vrtti. Universal matter evolution happens through these Vrtti, these ensemble of particles with thermodynamic energies. tanmAtras are ‘measures’. (tat-that, mAtras-measures) of these Vrttis (thermodynamic energies). Based on these measures, five states (pancha-bhutas) evolve in Universal matter. In biological beings, pancha prAna are five organ systems through which biological growth or evolution takes place. What is matter and biological evolution..? Matter evolution is Energy manifesting in force-fields, becoming particles with residual entropy. This residual entropy enables particles to interact and become ensemble of particles (Vrtti, the ensemble of particles with thermodynamic energy potentials of Zero-point energy, Available energy, Unavailable energy, Work done energy and Internal energy). On these ensemble of particles, due to differentiation caused by tanmAtras (Pressure, Volume, Temperature, Change in Internal energy and Entropy), evolution of complex matter forms like elements, compounds, mixtures, larger structures of matter including galaxies, stars, planets etc happens. Biological evolution is signaling established in complex organic compounds becoming cell. This signaling enables information processing by cells. This information processing ability is consciousness which leads to ensemble of cells called organ systems (Vrtti, the ensemble of cells called organ systems such as prAna, vyAna, udAna, apAna, samAna). On these organ systems, due to differentiation caused by tanmAtras (Level of information processing/consciousness, catabolism, anabolism, Homeostasis, and growth of biological cells) of the Vrtti, evolution of complex biological beings happen, which leads to more an more information processing capability, more and more consciousness. Growth in biological structures (cells) (equivalent to change in internal energy in matter. Entropy is information. Capability to process more and more information is consciousness. Information manifests as 'signaling' in biological beings. Pressure is having high inter-molecular attraction. 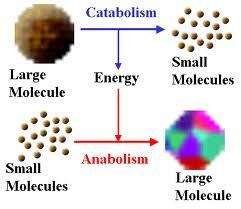 Capability to break that inter-molecular attraction and derive useful energy out of it is Catabolism. Volume is occupying three-dimensional space. Anabolism is growth defined as increasing volume. Temperature is kinetic energy spread across an ensemble of particles. Homeostasis is ensuring constant conditions of energy (in forms of temperature, concentration etc) across a biological being. 5. Growth in biological cells is equivalent to change in Internal Energy. Growth in biological cells with signaling/information processing capacity is equivalent to change in internal energy of matter with some entropy. Signaling is equivalent to information. Information processing is consciousness. How do the tanmAtras of Vrtti manifest the Pancha-bhuta..? Particle is energy manifesting in force-fields. Particles manifesting in force-fields, at bare-minimal are said to have zero-point energy. Such particles with zero-point energy are said to be in bosonic state of matter, which is known as Bose-Einstein Condensate state of matter. They have a 'residual' entropy (dis-order), a non-zero entropy. Ensemble of such particles have inter-molecular forces of attraction and repulsion. The inter-molecular attraction compresses the ensemble creating an inherent pressure. The repulsion enables the ensemble to acquire a specific volume. Thus pressure and volume are manifestations of opposing forces of inter-molecular attraction and repulsion. When an ensemble of such particles, due to their lowest 'net' inter-molecular attraction, in their natural state, have the lowest pressure and maximal volume, they are said to be in gaseous state of matter. Lowest pressure in natural state means gases can be compressed heavily. It also means they occupy the maximal volume due to low inter-molecular attraction. If such ensemble of particles with lowest pressure and maximal volume in their natural state acquires high kinetic energy which means high temperature (T), then part of these particles gets ionized. Such an ensemble is said to be in plasma state. Plasma state is matter in fluid state in which other fat corpuscles or heavy ions float and move around. When an ensemble of particles with medium 'net' inter-molecular attraction, in their natural state, have more natural pressure than gas and less natural volume than gas, they are said to be liquid state. More pressure in natural state means liquids can be compressed but not to the extent of gases. When an ensemble of particles with high inter-molecular attraction, in their natural state, have a rigid structure where intermolecular forces create a balance between compressing pressure and expanding volume are said to be solid state. Thus with tanmAtras, the five measures of change in internal energy, Pressure, Volume, Temperature and Entropy, vrtti, the energy distributions become one of the pancha-bhutas, the five states of matter. When a signaling system gets established between compounds, life of 'biological beings' begin. These structures are called 'cells'. Signaling system manifests as electric-field between charges. This signaling system (udAna) processes the virtual photons of electric field. Since photons are bosons, they can said to be processing the bosonic form of matter. This signaling system of cells establishes a 'level of consciousness' or 'responsiveness to a stimuli'. Consciousness is the ability to process information or signaling in biological beings. In human beings, udAna, the signaling system is Central Nervous system. From a design pattern perspective, an udAna is organ system for establishing consciousness (central nervous system or signaling system) in biological beings similar to ensemble of particles with residual entropy in matter. Ensemble of cells, which is an organ system, that processes or breaks down gaseous form of matter is prAna. The primary function of such organ systems is stroking up catabolism (breaking down) to invoke large amount of anabolism (growth), in aerobic or anaerobic environments. For eg. in cellular respiration process, molecular oxygen derived from air is used as oxidizing agent to catabolize chemicals and turn them into ATP. ATP is the powerhouse of every cell to trigger their growth (anabolism). This organ system supplies oxygen required to stoke the catabolization and not the chemicals that are catabolized. Thus it indeed contributes a little to catabolism per se, but contributes a lot to anabolism. Thus catabolism is stoked up to create powerhouses for driving huge anabolic reactions. Thus these organ systems contribute to huge anabolism by stoking up catabolism. From a design pattern perspective, prAna, the organ system contributing little to catabolism to fuel huge amounts of anabolism, is similar to gaseous form of matter, an ensemble of particles having less natural pressure (less catabolism) and more natural volume (more anabolism). Ensemble of cells, which is an organ system, that contributes to homeostasis is vyAna. The primary function of such organ systems is energy transport that helps maintain equal amount of energy (temperature, concentration of matter etc) across all parts of a biological being. Homeostasis is maintaining relative constancy of parameters including temperature, concentration etc. Essentially ensuring energy in different forms is available to all parts of a biological being. This is done by circulating plasma. Plasma is matter in fluid state in which other fat corpuscles or heavy ions float and move around. From a design pattern perspective, vyAna, the circulatory system of plasma with fat corpuscles, is similar to plasma form of matter in which high temperature ionizes parts of matter and allows these ions to move around. Ensemble of cells, which is an organ system, that contributes to elimination of wastes is apAna. The primary function of such organ systems is to drive away wastes from a growing biological being. These organ systems do more catabolism as they break down intermolecular forces and eliminate wastes. They do very less anabolism, as they do not contribute to building up volume/growth, but more to eliminate the wastes. From a design pattern perspective, apAna the organ system that catabolizes (breaks down) to eliminate wastes with little or no anabolism is similar to liquid form of matter with more natural pressure compared to gas (more catabolism) and minimal natural volume compared to gas (less anabolism). Ensemble of cells, which is an organ system, that contributes to digestion and absorption and thus high growth of a biological being is samAna. Such organ systems have a balance of Catabolism and Anabolism. Hence the name 'samAna' (which means more balanced, equal etc). These organ systems processes 'solids' and catabolize them into chemicals (sugars, amino acids, fatty acids). These chemicals become ATP and thus contribute to huge anabolism (growth) also. Thus these organ systems contribute equally to catabolism and anabolism. From a design pattern perspective, samAna the organ system that contributes both catabolization (breaks down) and anabolization (growth) is similar to solid form of matter with a balance between internal natural pressure compared to gas/liquid and natural volume compared to fluids. Thus based on the tanmAtras of Levels of consciousness, Catabolism, Anabolism, Homeostasis and Biological cells the processing of the pancha bhutas happen in the organ systems.